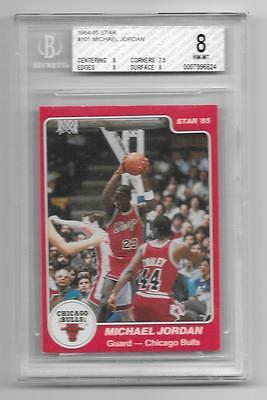 BGS 8 MICHAEL JORDAN 1984-1985 STAR ROOKIE RC #101 CHICAGO BULLS RARE NM-MT ! Description: All cards are in NM or better condition unless otherwise noted, IF VINATAGE PLEASE CHECK SCAN FOR CONDITIONS. If you are unsure of anything please ask questions before you bid. Also please check scans for condition on VINTAGE ITEMS. We reserve the right to refuse bids from anyone with recent negative feedback or anyone with a feedback rating of less than 5. Thank you for looking at our auctions. You are currently bidding on: ITEM IN TITLE DECRIPTION AND THE PICTURE... PLEASE EMAIL ANY QUESTIONS YOU MANY HAVE ... THANKS AND CHECK OUT MY OTHER AUCTIONS! Payment Methods: PAYPAL ONLY (to confirmed address only) Payment is due within 2 days of the end of auction NO excpetions, cases will be opend automatically thereafter. Combined shipping is 1.00 for each additional lot won only on auctions from same night, International is done thru Global shipping program. Thank you!